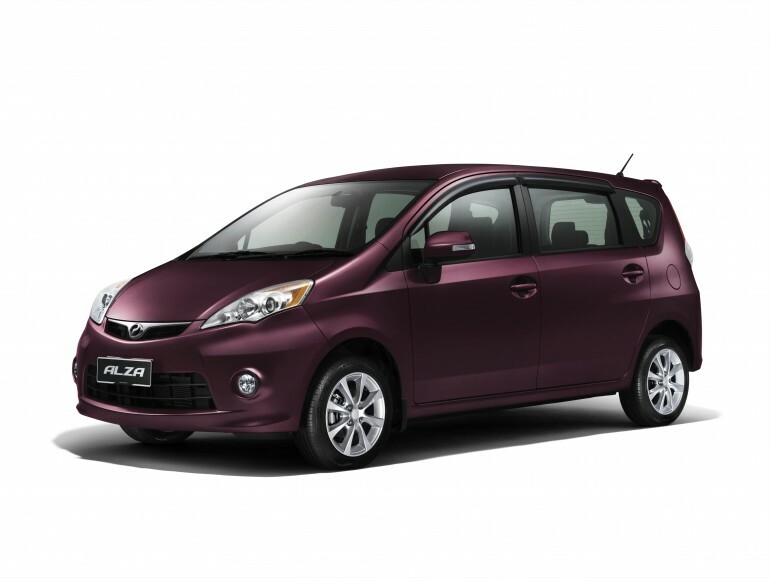 Found something interested about our newly launched Perodua Alza. 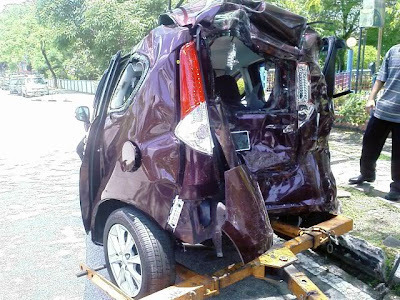 Wonder how a Perodua Alza will become after a serious car crashed? 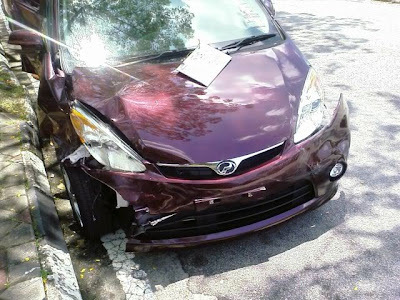 And what I managed to find from the internet is just a MIROS Crash Test for Perodua Alza, which you can find it from youtube or watch it at the end of this post. 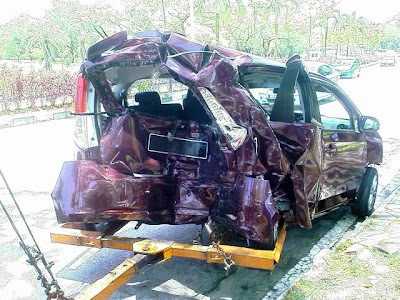 Here is a real case that a Perodua Alza is being hit hard by a lorry/truck. Just look at the pictures, the car will be totaled and there is no chance to repair it and restore it's glory. I could not judge must on the quality of the car since I am not an expert on this and the car is being hit by a lorry/truck. 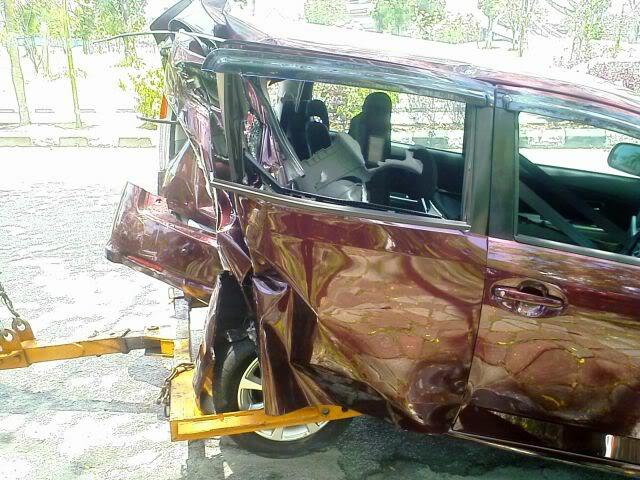 Furthermore, do notice that the airbag is not deployed even the front of the car is being hit. Therefore I just leave the decision making to those who wish to buy Perodua Alza. Anyway, I am not offending to those who own a Perodua Alza. I'm not an alza owner or something, but let me say something, please note that only in the event of static crash will trigger airbags, even if the alza being pushed to front direction by the truck (lorry) behind and hit something ahead of it, it is not a static crash, thats why airbag doesn't pop up in the picture, as compare with the CRASH TEST video, that alza is hitting a huge mass which makes it comes to complete stop, so, only a crash that makes a car comes to static will trigger airbags!! I don't own any cars they make but all I can say is that they should consider the durability and quality of these cars. Based from those pictures, I think it has no chance to be repaired. If you notice in the video the car only crashed in front and not the back so you can see that the safety features of the cars are only in the front so its no wonder that The car was crushed like that. I wonder what speed the lorry hit that cause the car to be destroyed to that extent. The victim should get the best personal injury attorney los angeles can offer. It's for him to get the compensation he deserves. Based from those pictures, I think it has no chance to be repaired. You can avoid such an accident if you just follow the traffic rules. Everything is organized in the road if everyone will consider these rules. Its' a good thing that no one got hurt, the truck driver should have his licensee revoked after this happening. I hope no one got hurt because of the car accident. The car looked so nice, such a waste!